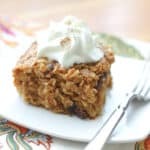 Pumpkin Spice Baked Oatmeal is one of our favorite breakfasts; my boys would happily eat this every single morning all fall long if I let them. There is just something awesome about the way oatmeal changes when it is baked. Almost like a cake, but not nearly so sweet, this is a hearty breakfast that we all love. 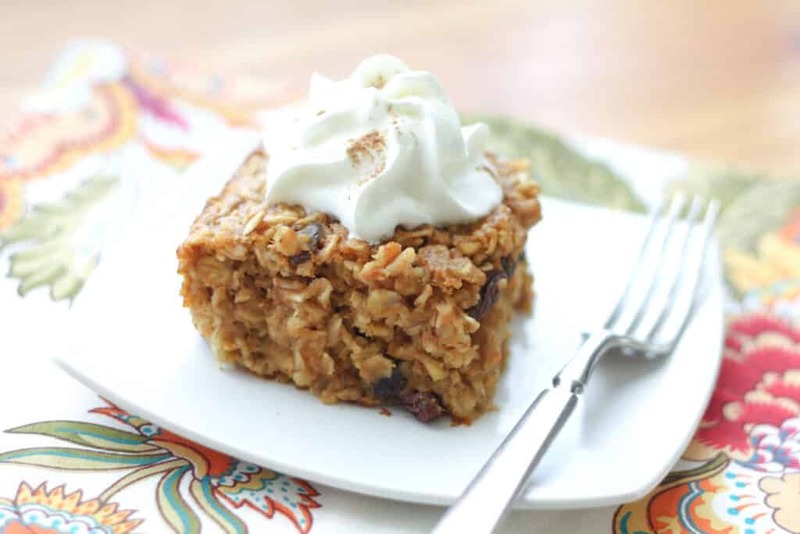 Pumpkin Spice Baked Oatmeal has been our Thanksgiving breakfast for the past few years. I’m in favor of anything that makes my holiday kitchen work easier, there is enough other cooking happening for the holidays, an easy breakfast is ideal. 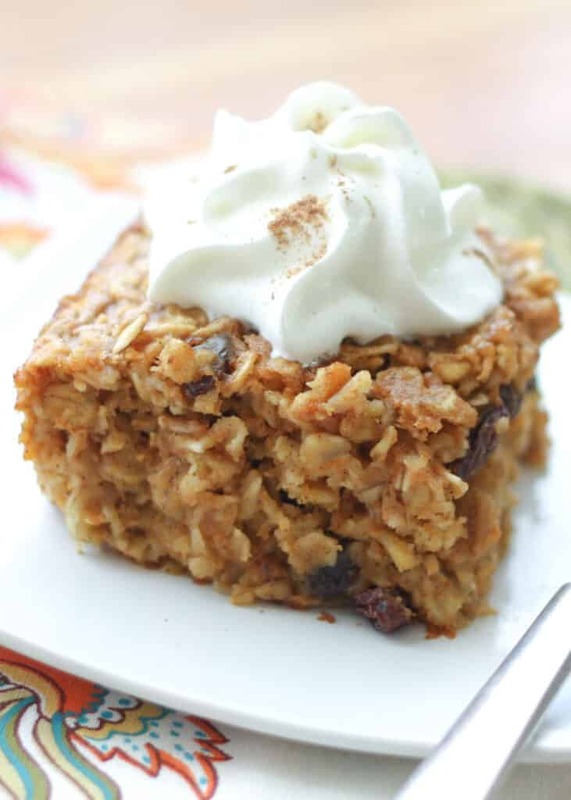 This hearty oatmeal breakfast bake is as easy as it gets. Preheat oven to 350 degrees. Stir together all ingredients and then pour into a well-greased 8" square or 8x10 baking dish. Bake for 30-40 minutes (or 40-45 minutes if cold from the fridge in a cold oven - if cooking this cold from the fridge, give the oatmeal a quick stir first), or until knife inserted in center comes out mostly clean. Enjoy! FREEZER MEAL: Let the oatmeal cool completely and then cut or scoop into portions. Store the oatmeal in airtight freezer bags or containers. Reheat in the microwave with a tablespoon of water. This is a great overnight breakfast recipe. Everything can be stirred together the night before, poured into the pan, and then kept in the fridge overnight. When you wake up, just move the cold pan right into the oven. It should say 6 servings. I'll update the recipe now! Thanks for catching that! I love this, looks amazing! What can I substitute for olive oil? Melted butter or any light flavored oil will work great, Sarah. Enjoy! I just made this for our Thanksgiving morning breakfast. It came out so delicious! And soooo easy! I mixed all the ingredients last night, put in the refrigerator, and into the oven this morning. I used slightly less sugar, and subbed out a few items: coco-almond milk for the cows milk, coconut oil for the olive oil and added about 1/4 cup more pumpkin for more pumpkin flavor. The spices are right on, it does taste like pumpkin pie and each bite has a distinct spiced flavor. Thank you for the great and easy recipe!!!! Happy Thanksgiving!..will definitely be making this again! Just made these for breakfast! They were delicious! I made them into cupcakes. It made exactly 20 cupcakes. I baked them right out of the fridge fro 25 minutes. Thanks for an awesome recipe. Thank you! My husband hates regular oatmeal, but he's on a low-FODMAP elimination diet, and this recipe fits the bill (except for the raisins, which he hates anyway, so I omitted them). He loved it—genuinely loved it, didn't just tolerate it like the gluten-free pancakes.Thanks again for sharing! Probably a silly question how do you makek the pumpkin purée as I have a fresh pumpkin to use, is it just scoop it out and mash it up? You'll need to roast or bake the pumpkin and then puree it. I haven't tried a baked oatmeal in the instant pot. If you do play with baking the recipe that way, let me know how it works for you. I linked to this recipe from Yummly last week and tried it this morning. It's the first time I've had baked oatmeal, and I love it! Since I live alone, it is great that I can freeze this in portions and eat it over the next couple weeks. Next I'm going to try the Apple Pie version. Thanks so much! Just made this today and it is delicious! I added .25 cup each chia seeds and hemp hearts for added protein. Perfect baked consistency. Thank you for this recipe. Can you please tell me what is pumpkin purée and can it be found in a grocery store or do I have to make my own? Pumpkin puree is simply canned pumpkin. Be careful not to buy the canned "pumpkin pie mix" it's easy to mix them up. You want the canned pumpkin without anything else added.